G1VVP - Skegness DX: The (In)Famous Faulkner FM Loop Antenna! The (In)Famous Faulkner FM Loop Antenna! Yes, that's how it has come to be known. I didn't design it. I didn't invent it. But I did create this scribble of a diagram in Micro$oft Paint. Yes. Try not to laugh too hard. The story behind this antenna goes back to the 50s or 60s when a DXer called Frank Smales published an article in the Medium Wave News called "A Loop Antenna for FM?" It is based on the design of a cubical quad. But the beauty of this simple folded loop is that it has a reasonable amount of gain over a half wave dipole. I have seen quotes of up to 5.5dB, but we can probably expect it to be somewhat less than that. Let's very roughly compare it to a three element Yagi in terms of gain. What I do not want to do in this article is delve into anything technical. This is a simple antenna which is easy to throw together using "Bodgitt & Scarper" techniques and ... it actually works very well! It's not a big antenna. It's less than a metre square. It works well indoors and out and, because this design is not easily de-tuned by being close to nearby objects, it even works quite well when I've had it leaning against a wall on the living room floor. I have been singing the praises of this design for years and I often recommend this little antenna to newcomers to the hobby since they are so simple to put together and cost next to nothing. This is the reason it has come to be known as the Faulkner Loop Antenna. Oh well, it's a small claim to fame. It's amazing what you can do with an old piece of coax. That's right! It's a piece of coax. The design in the original MWN article recommended the use of a length of coax to form the loop itself. Make sure you twist the inner core and outer braiding together though. To resonate in the centre of our FM band (98 MHz) the loop needs to be about 30 inches square, that's 78cm in European. Add or subtract six inches to resonate at either end of the band if you want to experiment, but this is fairly forgiving antenna and should cover the entire band very well. Note the connection points A and B in the centre of the bottom part of the loop. If you have the coax fed at this particular point then you have a horizontal loop. rotate the loop 90 degrees so the feed is on one side and you have a vertical loop. If you connect in one of the lower corners then you have a loop of mixed polarisation, but since I haven't tried such a configuration I am unable to comment on how useful the performance is when this way. A 'slant' dipole doe not seem to be a good idea as you have a degree of 'loss' from both planes, so concentrate on horizontal or vertical. I do not know if the same is true of this loop antennas. The reason I built a loop antenna back in the 90s was because I had just moved into a property and did not have an outdoor antenna at the time. The loop really surprised me as I discovered that it had sufficient gain in order to resolve full RDS from meteor scattered signals. The loop was only resting on the bedroom floor and leaning against the wall at the time! With this level of performance I have always wondered why there aren't more of us using these simple antennas. I soon began using an FM loop when DXing mobile in the Derbyshire hills. The resulting logs were impressive, even when conditions were about as flat as the loop itself! The loop would be resting on a tree branch about eight feet above the ground. This loop receives 'front and back' with its figure of eight pattern and the the side nulls are very deep. You can also make this loop more directional by adding "reflector" and "director" loops of an appropriate size. But as with all antennas, the best results will be achieved if it is mounted outdoors and clear of nearby objects. This antenna uses Bodgitt & Scarper technology. It is so simple even I knocked one up in a matter of minutes. You don't need to rely on my design, however, you may wish to make the construction a lot more sturdy, but the purpose of this article is to show how you can achieve good results with the simplest of constructional effort. If you are going to use the loop externally for an extended length of time then it would benefit by being made more sturdy and suitably waterproofed. 78 cm lengths = 312 cm total (or 4 x 30 inch lengths = 120 inches total). The receiving element itself is a 30 inch (78 cm) square loop of the coax, so you will need to construct a suitably sized wooden frame, say 10 mm (half an inch) less each side of the wooden doweling around which you will wrap the coax - this is just to make allowances for the coax which will then be the correct size. You could of course fix the coax to the face of the wooden frame. The coax needs to have a feed point half way along the bottom of the frame so cut coax to a 10 feet, 2 and a half inches (312 cm) in length and wrap this around the frame ensuring the inner core and outer (braid) are connected together, each end going into separate connections on a small electrical screw terminal block. The remainder of the coax will be used for the downlead - you can vary the length accordingly. Connect the two ends of the loop to either side of the coax downlead via the terminal block, either way around, it doesn't matter. The impedance of the FM Loop is 75 ohms. There has been much debate about this but this fact has been stated in older ARRL and RSGB publications. I cannot comment. Also, recent computer modelling has given the impedance as 75 ohms at resonance too. The loop should be positioned broadside to the transmitter for best pick-up, while the nulls can be found endways on. The loop also seems to have other quirky attributes, exhibiting a slightly unidirectional pattern at times. The coax download is probably playing a part. So, in conclusion, this is antenna is 'very' easy to construct. It is very efficient and seriously outperforms my vertical FM whip with several extra dB of signal. As I have said, this loop has a big advantage in that it works well indoors and doesn't seem to mind too much where it is located. This and the constructional aspects make it an ideal antenna for beginners. No, it 'doesn't' look like much of a DX antenna, but I have been very surprised by the reception I have had and it has become an essential part of my mobile DX setup. Used indoors at home I have been able to eliminate local Lincs FM on 102.2 and leave the frequency free for Galaxy from Birmingham at noise-free listenable strength - something none of my other yagis or rooftop beams have ever been able to achieve. Instructive article John ! Patrick, south-east France. Thank you Patrick. So many DXers are unable to have elaborate outdoor antennas. I think we would all have enormous towers and phased arrays if we could, but it's surprising how well this little loop performs. It's so simple to construct too. Best wishes and best DX Patrick! Hi John ! 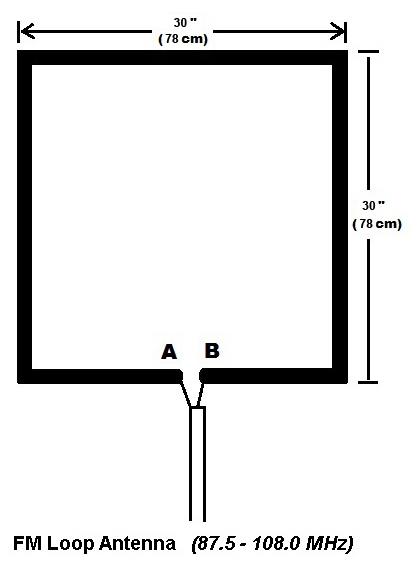 I just realized you mention the loop needs to be 84 cm square (to resonate around 98 MHz). Other sites say 74cm for the same frequency (i.e http://www.hamradio.in/circuits/fm_antenna.php). This puzzles me a bit !! What formula do you use to get this result ? Hello Patrick. My information is based on an article originally written for the Medium Wave Circle (in the 1960s I think) by Frank Smales. The FM band would have only extended up to 97 or 98 MHz back then and the recommended dimensions were 30 inches square, whatever that is in cm. I don't usually 'do' metric. So I used an online dipole calculator to work out the dimensions - http://www.kwarc.org/ant-calc.html I just tried this again though and as per Fuckov's Law I am getting 1.45 metres as the dipole length. I am confused myself now :O) Please remember this is a 'thrown together quickly' antenna and is not refined in any way. The term "Bodgitt & Scarper", as used in this article, is an English expression which describes an imaginary company where the bosses names are Mr Bodgitt and Mr Scarper. In this case, the word 'bodge' refers to something which has been built clumsily or hastily, while 'scarper' means "RUN ... QUICK!". I hope you understand the humour. Since my brain cell is not functioning at full speed at the moment I am not able to perform any calculations which make sense to me. I think the problem is 'old age' on my part. Funny reply John, I like it !!! Just found another couple of online 'Quad calculators' (i.e http://www2.mmae.ucf.edu/~ssd/ham/quadcalc.html) and this gives 120 inches wavelength, that's indeed 30 per leg (a bit longer than the result you got, but still inferior to 33). Well, it looks like 33 inches is a bit too long to resonate in the center of the band, BUT as you mentionned this is a "quick and dirty' job !! See you soon John ! I wish I could remember more information about the original calculations. If I write articles such as this, I usually post to a good friend who is, technically, very competent, just to make sure I have not made any mistakes. This has already been checked, but I will see if it can have it checked again, just to be sure that there isn't a glaring error here. The things about the FM broadcast band is that it is VERY wide and it is unrealistically to expect a single antenna to perform perfectly across the entire 20 MHz range, so compromises have to be made. 98 MHz is virtually in the middle of the band and so any calculations are based on that. For the benefit of anybody else reading this, ideally, it would be better to have several antennas, each one covering a smaller segment of the band, but that is rather impractical. So where does 33 inches resonate in your calculations? Is it close to 98 MHz? I don't know why different sites are yielding such conflicting figures. 33 inches should resonate around 89 MHz (according to the calculators I found). The coax would certainly have an effect on the overall performance of the antenna, not just because of the velocity factor, but also the positioning, etc. Moving the coax around underneath such an antenna would interact with the directivity to some degree. I did not factor this in for such a simple antenna, but it's a valid point and thank you for mentioning it. As I state above, I am not a technical genius. I know very little about the technicalities behind this and I thank those who have been kind enough to mention the finer details like this. I am very much a 'get it done quick, stick it up and see what happens' person. A 'haphazard' antenna can produce interesting results, but to be technically accurate is probably more important. I hope the information above is substantial enough to help, but the article was written from a layman's point of view and with other layman in mind. "Layman" = a person without professional or specialised knowledge in a particular subject. Just coming back to this slightly later than I had intended. I re-calculated the dimensions of the loop using this site: http://n6ach.com/calc/quad.html which says that 98 MHz should have each side of the loop measuring 30 inches/78 cm. I will amend the article. Please tell me if you agree with this. Thanks. Hi John ! In theory, 30 inches should indeed give better results (at least at the top of the band) but is there a real and concrete improvment ? It would be fun to check ! 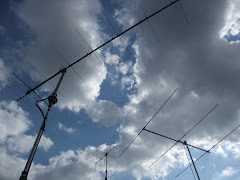 Great Blog John, Takes me back to being a teenager and making dipoles with coat hanger wire. I noticed the article was mention and cover in this months BDXC. Speaking of which, John you should considered writing some articles for the BDXC, as I always find your radio related stuff, a top quality read. Oh wow! I am going bright red now ;O) I never consider that my written work is anything special. Thank you so much for your nice words Damien. I could tell you a story or two about the things I used to get up to with makeshift aerials when I was much younger. Crazy stuff! It was all good fun though. Where have those days gone? The problem is, when I do look back at some of the articles I have written in the past, I just cringe with embarrassment. I suppose we all do it. We live and learn and, hopefully, we get better as we go along ... if we get it right. These days, I tend to do more ranting than anything else. A sign of old age I fear, but I enjoy writing about my experiences. I think that makes the difference. Too many people write about the facts but don't air the human side and all their mistakes. It's all well and good, but it's nice to meet the real people behind the articles. I have never been a member of the BDXC but regret that. My 'club' days are long over. Skywaves mostly does it all for me these days. It's a nice band of people, sharing their DX experiences and I think that's enough, but I do miss a good DX publication - something to grab hold of. Anybody is more than welcome to use or quote from any of my articles, but it's nice if the source is credited. I would love to do a piece about Jaguar for BDXC. I'd need to check that was OK first, but this is quite a revolutionary piece of MW DX software and I have been using it for the last year or more. I can't recommend it enough. Perhaps I should write to Dave or Tony and see if they would like something putting together. When the new v3 of Jaguar is released, I will be putting a few videos together for my YouTube channel showing it in action, so I am looking forward to that. The ultra design luxury outdoor roof very beauty. major views is outdoor design work Using Aluminium Scaffolding To Finish the job. So sorry I missed your question. Either I did not receive the alert or I missed it completely. Many discussions can be found online where users of both antennas compare their results. Search on sites like qrz.com for these. I hope this helps for now, but it does seem that people have varying opinions as to which is best, the Yagi or the quad. I hope this information is useful and apologies again for the delay getting back to you.